These Slow Cooker Candied Pecans are a tasty snack, crunchy addition to a salad or unexpected addition to a holiday dessert buffet. And if you need a little something for a hostess or teacher, these are sure to be appreciated. Nuts are a pantry staple at my house, but plain-Jane nuts just don’t cut it for the holidays. 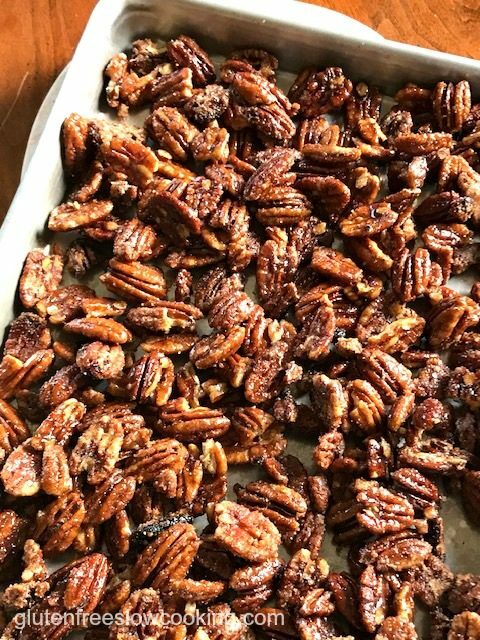 Pecans coated in a crunchy, sweet glaze are soooo much more special, and making them in the slow cooker is really the best way to prepare them—the risk of them burning is much lower. 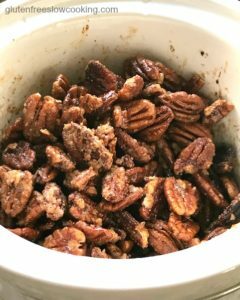 In fact, our Slow Cooker Candied Pecans are so quick and easy you can make several batches so you’ll have plenty throughout the season. Feel free to swap in walnuts instead of pecans if you prefer. Also, be sure to check out the sweet-and-spicy variation listed at the end of the recipe if you’re looking for something appropriate to serve with cocktails. Whisk together the sugar, cinnamon and salt in a medium bowl; set aside. In a separate bowl, whisk the egg white until frothy. Add the pecans and stir until the nuts are well coated with the egg white. Transfer the pecans to the bowl with the sugar-cinnamon mixture and toss until they are evenly coated with the sugar mixture. Add the nuts to the slow cooker. Cover and cook 1 hour on HIGH. Stir the nuts, cover and cook an additional 30 minutes. Stir again, cover and cook another 15 minutes. Transfer the pecans to a baking sheet lined with parchment paper; allow them to cool completely. Using clean hands, break apart any nuts that have stuck together. Candied pecans can be stored in a covered container at room temperature for up to 2 weeks. Sweet-and-Spicy Pecans Variation: Add 1/2-3/4 teaspoon cayenne pepper and 1/2 teaspoon dry mustard to the cinnamon-sugar mixture.